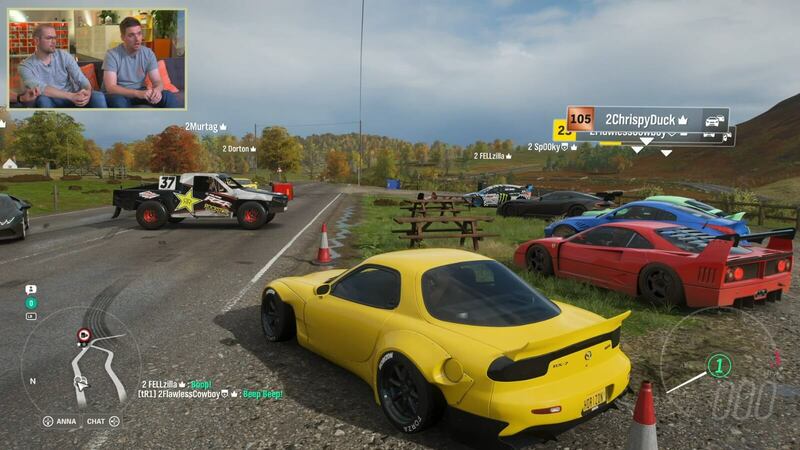 Playground Games hosted their second Forza Horizon 4 seasonal livestream today from their studio in Leamington Spa. Following last week’s Summer livestream to celebrate the recent British heatwave, this one focused on Autumn and that meant we were greeted with its striking colour palette of reds, yellows and oranges, as well as ambient moisture in the environment, standing pools of water, fallen leaves on the roads, and of course, deformable muddy terrain. This week’s livestream also focused on the map and revealed a brand-new Showcase event featuring that hovercraft we spotted in the reveal trailer. 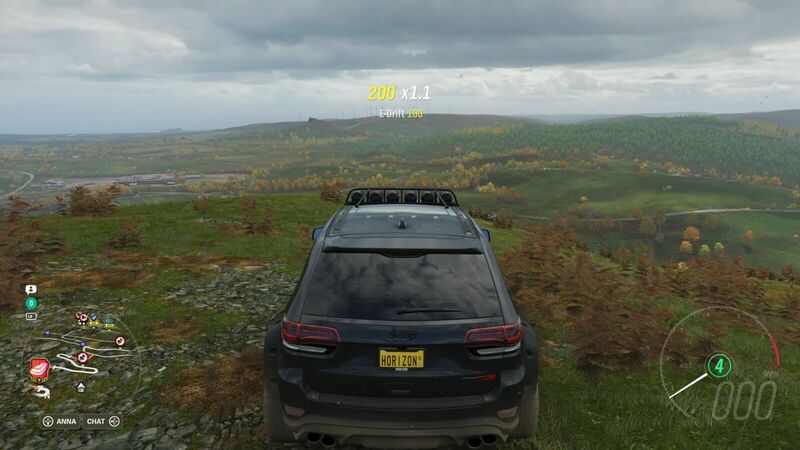 We were also treated to a deeper look at Forzathon Live and the Horizon Life online system whilst learning a ton of new nuggets of information that will make the overall Forza Horizon 4 experience better for everyone. 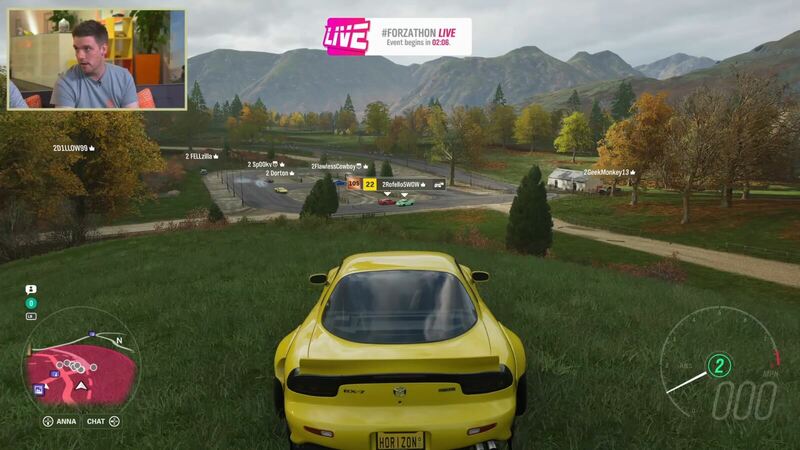 The livestream began at one of the player-owned houses called 'Croftdale Farm' located by the Scottish Highlands, an area which highlights the verticality of the map in Forza Horizon 4. Here you’ll find vast mountains and steep slopes, as well as a hidden Barn Find. Taking on the Glen Rannoch in the Perthshire Scottish Highlands would be the shiny 2018 Jeep Grand Cherokee Trackhawk – equipped with one of the new off-road bodykits available in Forza Horizon 4. Creative Director Ralph Fulton revealed that a total of 12 of these bodykits will be present in the game and they can be applied to vehicles such as Jeeps and SUVs to turn them into extreme off-roading monsters. In addition to some exploration around the Scottish Highlands, we were also treated to seeing a brand-new Showcase event that’s set there – The Behemoth. This one sees players racing a Hovercraft in the Scottish Highlands using a Toyota Baja Truck. The hovercraft was originally supposed to be featured in Forza Horizon 3, and it was in fact built for that game. Playground Games had an idea for a Showcase event that would utilize it, but it didn’t work out. Instead they played around with it for Forza Horizon 4 – and then it started to come together. With Forza Horizon 4 featuring deformable areas and breakable rock walls, not to mention the overall verticality to its map, the hovercraft made perfect sense as it could slide and smash through various environments easily. Whilst Playground Games doesn’t plan to reveal anymore Showcase events until the game’s release, the team did show off the in-game map – and it hints towards a Showcase event featuring a Steam Train at the Glenfinnan Viaduct. In addition to the Showcase events featured at launch, the developer will also remix them post-launch to play in different ways. These might include different times of day, as well as different vehicles, weather conditions and seasons. Following the Showcase event, we were treated to a deeper look at the Horizon Life integration in Forza Horizon 4. This is everything related to online play in the game, and it was shown off by Chief Game Designer Ben Thaker-Fell and Principle Game Designer Mike Brown. Horizon Life is the name given to the online freeroam experience in Forza Horizon 4 where you roam, race and cruise with other players in a shared sandbox experience. Whilst you’ll always be with other players in Horizon Life, those who are not friends with you will be ghosted. Similarly, traffic will now also be ghosted when completing PR Stunts, which means you’ll no longer be crashed into when trying to complete a Drift Zone. You can also instantly switch from the online experience to Horizon Solo, which will see the real-life players replaced by Drivatars. You can even turn on collisions in Horizon Life if you prefer – the choice is all yours. The Quick Chat feature was also highlighted, which can be used for communicating with players via in-game text emotes. The use of Photo Mode and Rewind features in online were also displayed, with players being rewarded in-game for taking their own photos – there’s now a campaign experience built up around it. As for vehicles, the Mazda RX-7 with a Rocket Bunny kit was being used to show off the Horizon Life experience. In addition, a Nissan 350Z also boasting a Rocket Bunny kit could be spotted. 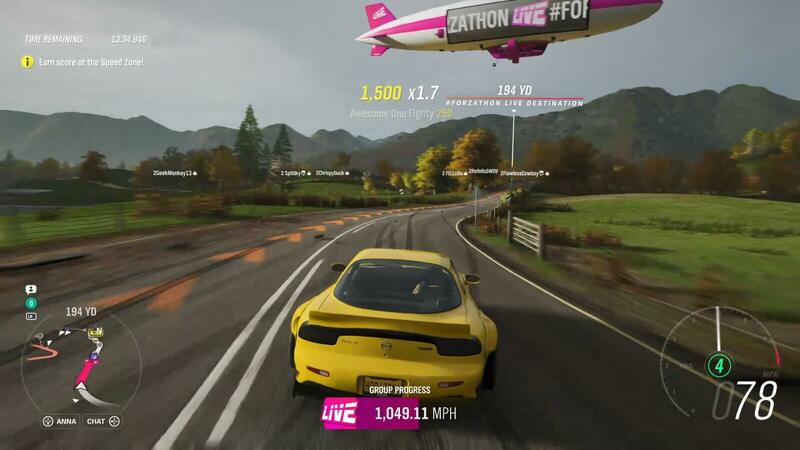 Forzathon was also showcased during the livestream and in Forza Horizon 4, there’s different types of events and challenges to complete. Daily Challenges will offer different tasks to complete, such as earning 100,000 points on a Drift Zone or 3 stars on a PR Stunt, whilst Weekly Challenges will center around different car stories with challenges surrounding a specific vehicle. These will offer around 30 minutes’ worth of gameplay. Forzathon Live will offer events that are synced worldwide. They will start for all players at the same time – every hour, across every day, week, month, and season – and will promptly begin on the hour. When a Forzathon Live challenge becomes available, you’ll need to follow to blimp to complete the various open-world challenges. There’s 3 stages that will increase in difficulty, and everyone in the Horizon Life session will have 15 minutes to complete the objective. The more players you have, the easier it is – and everyone earns the same reward, regardless of the contribution they made. Forzathon Live events are also introduced through a voiceover announcer and a Group Progress screen will show how far you’ve progressed in the current challenge. There’s also a countdown timer to show how long you have left, but there’s no leaderboard or individual scores for Forzathon Live. This is to prevent harassment towards new players as well as those who aren’t as skilled – it’s a team effort at the end of the day. 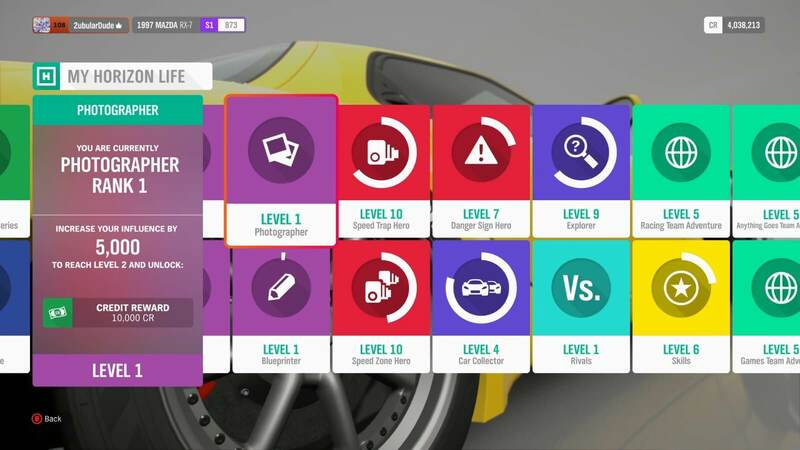 Forzathon events pay out Forzathon Points that can be spent in a shop full of exclusive items that are typically only unlocked via wheelspins. These include legendary cars, new clothing items, emotes, and more. The collection of items available to purchase update on a weekly basis. With more than 450 cars available in the game, over 500 character customization items, around 50 emotes and the return of Forza Edition vehicles, there will be plenty of content for players to unlock in Forza Horizon 4 – whether it’s via credits, wheelspins or using Forzathon Points. 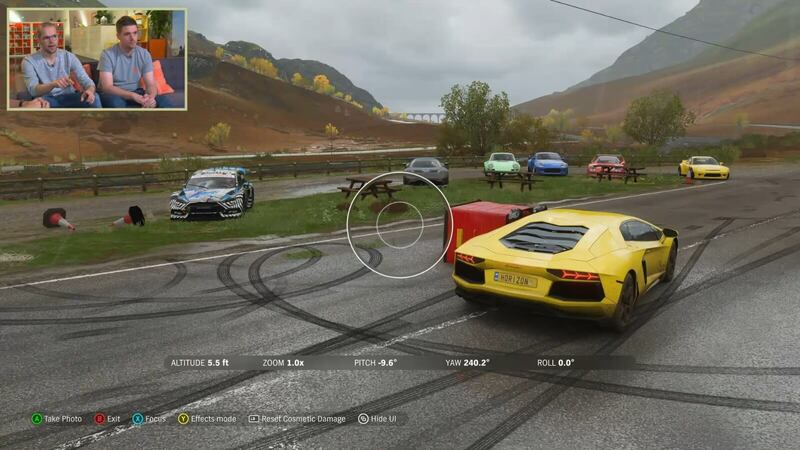 Forza Horizon 4 also has ambient sounds that you’ll hear in the background, and the soundscapes change by seasons and the location. There’s even regional birdsongs, with different birds and songs for different regions. 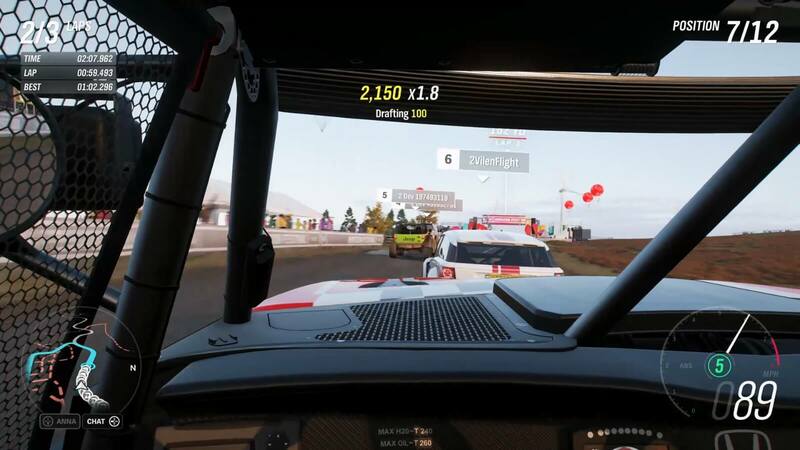 Players can also change their car from anywhere on the map at no cost – and it loads in super-fast, in comparison to Forza Horizon 3, in which you were charged for this functionality and it came with a lengthy loading screen. Skill Songs also return in Forza Horizon 4, but they’re unlocked in “a slightly different way.” As for the soundtrack, this is an aspect of the game that’s worked on right up until the last minute, so don’t expect a reveal until much closer to the launch date. Playground Games also spoke about ‘Seasonal Championships,’ which are another aspect of Seasons that join the themed Forzathon events and the way the world changes in terms of both looks and environments. 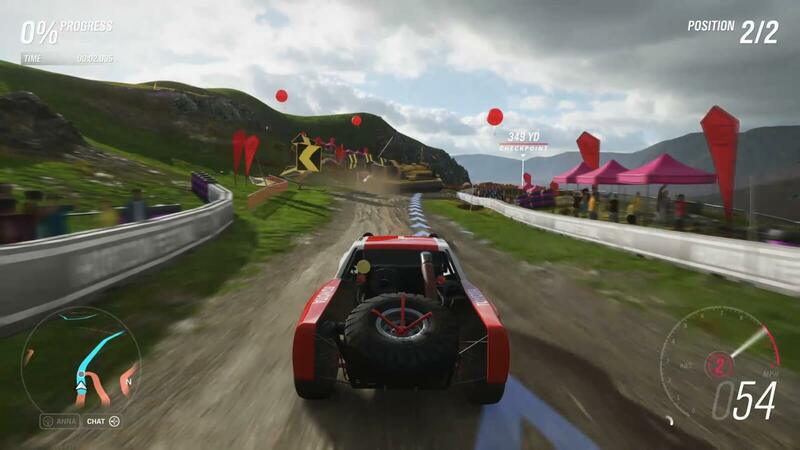 Before the livestream wrapped up, the developer also highlighted its mud track arena based on a real-life off-road adventure park that Playground Games used to research – the Mudkickers Adventure Park. There is where the Playground events like Flag Rush and Infection will take place. To create the location, the developer had to overhaul how the game represents variable levels of moisture, as well as the dips and divots for where water collects. Forza Horizon 4 comes with true mud physics that are dynamic, allowing them to deform and change if you drive over them. 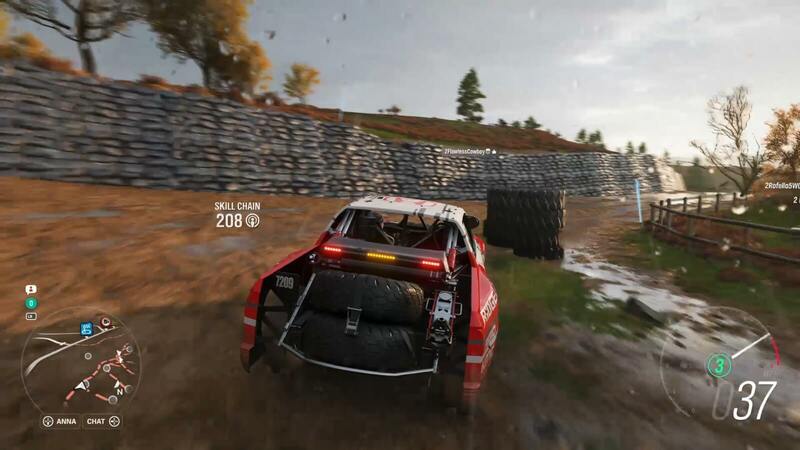 Players will also find a big change when going from asphalt to off-road, and there’s even huge puddles of water scattered across the adventure park as well. Naturally, there’s race routes that take full advantage of the Mudkickers Adventure Park – and these were highlighted on-stream, with the Halo Warthog showed driving about in the race. Players will experience the asphalt, mud and divots full of water as they blast through them in off-road rally monsters and trucks with their tire marks remaining visible on the deformable mud. This segment of the livestream also took place near the Yorkshire Moors, and the heather there will turn purple during the Summer months. 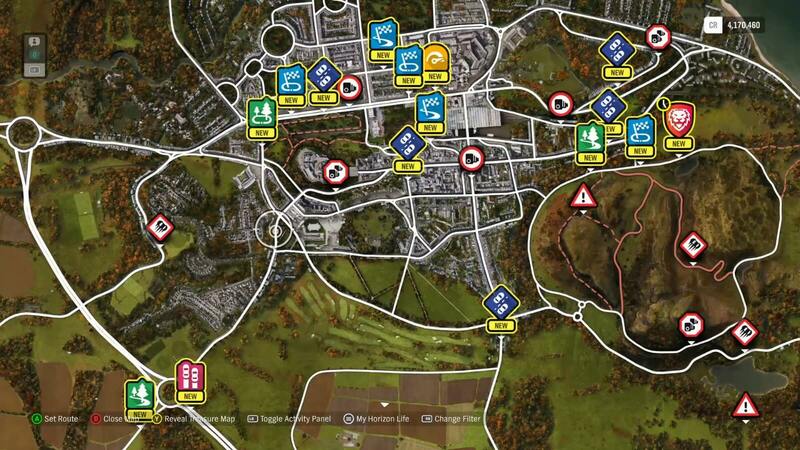 The livestream ended with another look at the map, which features a variety of different and unique locations. From the Astmoor in Cheshire and the Mortimer Gardens to the Cotswolds Villages and Welsh Valleys, not to mention Derwent Water and of course, the Scottish Highlands. We also had a glimpse at some of the lengthy Goliath-style race events that will be available, including The Marathon, The Colossus, The Gauntlet, The Titan, and of course, The Goliath. Influence Boards are also scattered around the map, which can be smashed into to progress further in the game. The pause menu for Forza Horizon 4 also highlights the current temperature and weather in the world. Next week’s Forza Horizon 4 livestream will be all about Winter. That means lots of snow, ice, and frost with very different driving experiences. We’ll also see a new competitive team-based online mode called Team Adventure, as well as ‘Car Mastery,’ which is progression for every car in the game. We’ll even have a look at Edinburgh City, which was described as “a real visual feast for the eyes” when driving through it at night time with all the lights. Playground Games also teased that “a lot of exciting things” are to be shown over the weeks ahead. Forza Horizon 4 launches on Xbox One and Windows 10 PC on October 2nd, 2018. It’ll also be available on the Xbox Game Pass subscription service from its release date. Be sure to check out the full Autumn livestream above for an hour of brand-new seasonal gameplay, and if you missed it, you can also check out our recap for last week’s Summer broadcast to get you up to speed with all things Forza Horizon 4 before things turn a little frosty next week in Winter. Get those snow tires ready and have those woolly hats, gloves and boots on standby – it’s sure to a cold one.